In a sorrowful anniversary sure to be remembered differently in the public and private realms in which the man traveled, prose columnist and cartoonist Prageeth Eknaligoda went missing one year ago today on the even of important elections in Sri Lanka. As this article written closer to the time of the disappearance indicates, the disappearance came in classic "never came home from work" fashion and could be seen in the context of other harassment/seizure incidents involving prominent journalists. Eknaligoda was also well known at the time for writing a series of articles and opinion pieces critical of the eventual election winners. There was some hope in the beginning that Eknaligoda would be released after the election, that this was merely taking the writer off of the board in terms of his ability to foment certain opinions -- Eknaligoda had himself been briefly detained a half-year earlier -- but the length of time involved in his disappearance has dampened those hopes. His status was part of a recent series of protests in Colombo. There was also a call for artists not to attend the country's book festival. The BBC News site has a lovely slideshow up featuring the missing man and his family's plight. 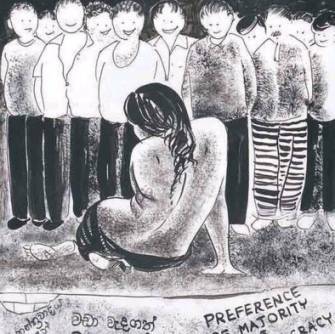 Although I believe that most people think it's his more current prose writing that may have led to his disappearance, Eknaligoda was an evocative cartoonist and many of his politically-focused efforts are a part of that series of images.